There are many ailments that will disqualify a person from military service. Very common issues involve the Central Nervous System, Head Injuries / Malformations, and Skin Conditions. The following information contains many of the more common disqualifications for recruits seeking military service. A history of, or current neurological conditions, history of cerebrovascular conditions, including but not limited to subarachnoid or intracerebral hemorrhage, vascular insufficiency, aneurysm, or arteriovenous malformation, are disqualifying. Current or history of disorders of meningocele or meninges, including, but not limited to cysts, degenerative and heredodegenerative disorders, including, but not limited to those disorders affecting the cerebrum, basal ganglia, cerebellum, spinal cord, or peripheral nerves, migraines and tension headaches that interfere with normal function in the past 3 years, or of such severity to require prescription medications, are disqualifying. (f) Multiple fractures involving skull or face. (g) Cerebral laceration or contusion. (h) History of epidural, subdural, subarachnoid, or intercerebral hematoma. (i) Associated abscess or meningitis. (j) Cerebrospinal fluid rhinorrhea or otorrhea persisting more than 7 days. (k) Focal neurologic signs. History of moderate head injury is disqualifying. After 2 years post-injury, applicants may be qualified if neurological consultation shows no residual dysfunction or complications. Moderate head injuries are defined as unconsciousness, amnesia, or disorientation of person, place, or time alone or in combination, of more than 1 and less than 24-hours duration post-injury, or linear skull fracture. History of mild head injury is disqualifying. After 1 month post-injury, applicants may be qualified if a neurological evaluation shows no residual dysfunction or complications. Mild head injuries are defined as a period of unconsciousness, amnesia, or disorientation of person, place, or time, alone or in combination of 1 hour or less postinjury. History of persistent post-traumatic symptoms that interfere with normal activities or have a duration of greater than 1 month is disqualifying. Such symptoms include, but are not limited to headache, vomiting, disorientation, spatial disequilibrium, impaired memory, poor mental concentration, shortened attention span, dizziness, or altered sleep patterns. Current or history of acute infectious processes of the central nervous system, including, but not limited to meningitis, encephalitis, or brain abscess, are disqualifying if occurring within 1 year before ​an examination, or if there are residual neurological defects. History of neurosyphilis of any form, including but not limited to general paresis, tabes dorsalis or meningovascular syphilis, is disqualifying. Current or history or narcolepsy, cataplexy, paralysis, weakness, lack of coordination, chronic pain, sensory disturbance or other specified paralytic syndromes is disqualifying. Epilepsy occurring beyond the 6th birthday, unless the applicant has been free of seizures for a period of 5 years while taking no medication for seizure control, and has a normal electroencephalogram (EEG) is disqualifying. All such applicants will have a current neurology consultation with current EEG results. Chronic nervous system disorders, including but not limited to myasthenia gravis multiple sclerosis, and tic disorders (for example, Tourette's), and retained central nervous system shunts are disqualifying. Skin is considered biggest organ of the body, however, not surprisingly, there are many ailments that occur on the skin that can be disqualifying for military service. From tattoos on certain body parts, major burns, plantar warts, to dermatitis and psoriasis, skin conditions have been preventing people from serving throughout history. Typically, any ailment on the skin or otherwise, if it prevents the use and proper wearing of safety equipment (HAZMAT, Helmet, Body Armor, etc), disqualification from service is imminent. Not Physically Qualified (NPQ) is the acronym given to those who do not medically qualify for certain professions in the military (like Pilot - vision) or for entering the service at all. 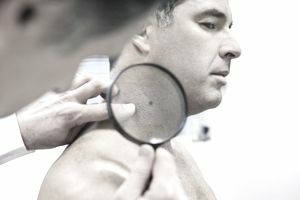 Current diseases of sebaceous glands to include severe acne, if the extensive involvement of the neck, shoulders, chest, or back is present or would be aggravated by or interfere with the proper wearing of military equipment, are disqualifying . Applicants under treatment with system retinoids, including, Accutane are disqualified until 8 (eight) weeks after completion of therapy. Dermatitis, also known as eczema, is an inflammation of the skin that results in a visible rash and itchiness. Current or history of atopic dermatitis or eczema after the 9th birthday is disqualifying. Current or history of contact dermatitis, especially involving materials used in any type of required protective equipment, is disqualifying. Current cysts, (other than pilonidal cysts) of such a size or location as to interfere with the proper wearing of military equipment is disqualifying. Current pilonidal cysts, if evidenced by the presence of a tumor mass or a discharging sinus is disqualifying. Surgically resected pilonidal cyst that is symptomatic, unhealed, or less than 6 months post-operative is disqualifying. Current or history of bullous dermatoses, including, but not limited to dermatitis herpetiformis, pemphigus, and epidermolysis bullosa, is disqualifying. Current chronic lymphedema, localized types of fungus infections, interfering with the proper wearing of military equipment or the performance of military duties, are disqualifying. Current or history of furunculosis or carbuncle, if extensive, recurrent, or history of severe hyperhidrosis of hands or feet is disqualifying. Current or history of congenital or acquired anomalies of the skin such as nevi or vascular tumors that interfere with function, or are exposed to constant irritation are disqualifying. History of Dysplastic Nevus Syndrome is disqualifying. Current or history of keloid formation, if the tendency is marked or interferes with the proper wearing of military equipment, is disqualifying. l. Current lichen planus is disqualifying. Current or history of neurofibromatosis (von Recklinghausen’s disease) is disqualifying. History of photosensitivity, including, but not limited to any primary sun-sensitive condition, such as polymorphous light eruption or solar urticaria; any dermatosis aggravated by sunlight such as lupus erythematosus is disqualifying. Current or history of psoriasis or radiodermatitis is disqualifying. Current scars, or any other chronic skin disorder of a degree or nature that requires frequent outpatient treatment or hospitalization, which in the opinion of the certifying authority affects thermoregulatory function, or will interfere with the wearing of military clothing or equipment, or which exhibits a tendency to ulcerate, or interferes with the satisfactory performance of duty, are disqualifying. Includes scars at skin graft donor or recipient sites. Scars at skin graft donor or recipient sites will include an evaluation of not only the relative total size of the burn wound but also the measurable effects of the wound, the location of the wound and the risk of subsequent injury related to the wound itself. but also the measurable effects of the wound, the location of the wound and the risk of subsequent injury related to the wound itself. Prior burn injury (to include donor sites) involving a total body surface area of 40 percent or more is disqualifying. Prior burn injury involving less than 40 percent total body surface area, which results in a loss or degradation of thermoregulatory function is disqualifying. An examination will focus on the depth of the burn, anatomic location (extensive burns on the torso will most significantly impair heat dissipation), and destruction of sweat glands. Prior burn injury susceptible to trauma or resulting in functional impairment to such a degree as to interfere with the satisfactory performance of military duty, due to decreased range of motion, strength, or agility due to burn wound/ scarring is disqualifying. Current or history of extensive scleroderma is disqualifying. Some tattoo placement and those that are otherwise prohibited under applicable military regulations are disqualifying. Current history of chronic or recurrent urticaria is disqualifying. Current symptomatic plantar wart(s) is disqualifying.